February 25th update: With today's final stage in Long Beach and Levi Leipheimer's wire-to-wire hold on the Golden Jersey, this completes the steephill.tv Tour of California race summary page, but there's still the Tour of California Grassy Knoll Project to keep you entertained. I didn't make it to Socal for the end of the Tour so the Grassy Knoll Project tailed off for the last few days, but there are still over 2000 photos and videos with more of mine to come. If you also have some photos and videos to add, then please do so before I make a "best of" collection. Special mention goes out to Ken Conley and Mike Norris for their fine Flickr contributions. And thanks to Amgen and the organizers for putting on a most excellent international bike race right here in California. Overall, it was an entertaining race and the fan turnout was higher according to the organizers; however, it may be a mistake to use the same host cities in consecutive years. The fan turnout was great but it seemed down slightly in the repeat hosting cities in Northern California from my standpoint. Here is a good article, published today, about the rising popularity of the Tour of California and bike racing in general in the U.S. "I think the Tour of California will become a big race," said Bjarne Riis, CSCs team director and a former Tour de France champion. "American cycling has a future. There are a lot of American riders and a lot of American sponsors." Once the Tour gains traction, hopefully they'll find a location where the local community is willing to pay for the first mountaintop road race finish. In order to grow the sport here in America, the average recreational cyclist needs to get (more) interested in bike racing. "Cycling has a great international footprint," says Shawn Hunter, president of AEG Sports, the race organizer. "But there is greater penetration in North America. There are now more people here who ride bikes than ski, play tennis and golf combined." Whether it's good PR or not, more sponsorship and big prize money could easily make the Tour of California one of the premiere bike races in the world. The timing is right while the established European race scene is in turmoil and with strong backing behind The Tour of California. But, all is not well in U.S. cycling, the Tour de Georgia, the second biggest stage race in the country, may not run this year if it doesn't come up with $800,000 before March 2nd and now it looks like this April's other USA Pro Tour event, the inaugural U.S. Open, is in trouble as well. 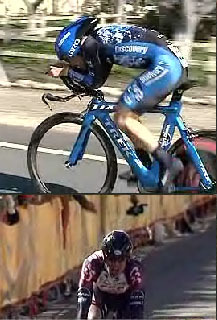 Hopefully, AEG will spend more money on improving the state of bike racing coverage on TV and the internet. Versus did a decent job with more camera angles and commentary from their "A" team of Leggett/Sherwin/Roll but there is much more potential. Live internet coverage on the official site was also good when there was enough capacity and when the weather was right, and it demonstated a glimpse of the future of live, interactive cycling coverage. Who would have thought yacht racing would be interesting to watch on TV 20 years ago? Do you know what I'm saying? February 21st update: The linking to multiple live, results, photos and video sources in the stage details summary table (see right) has now been implemented. You'll notice some links will now display a popup menu of choices as your mouse rollovers them. For example, here is today's link to live coverage from multiple sources. The Amgen Tour of California TourTracker is working well with sound. By the way, the almost live Tour of California Grassy Knoll Project has over 1200 photos and videos after three days. February 16th update: Tour of California asks fans to leave paint at home: unlike France, there are actually non-cycling fans in California. February 15th update: Live Tour of California internet coverage announced. 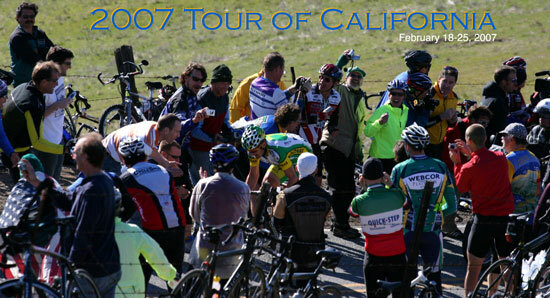 The 2007 edition of the Tour of California Grassy Knoll Project: cheer, click and collaborate! February 7th update: Similar to the 2006 Tour of California Grassy Knoll Project, spectators (and the media) can contribute their photos and videos to the event storyboard timeline. But, this year, the 'Knoll will be integrated with some of the most popular digital media sites on the internet and can link to photos and videos tagged "tourofcalifornia" from free sharing services like Flickr and YouTube. With a few mouse clicks, you can instantly include your Flickr photos and YouTube videos in the Grassy Knoll Project. January 16th update: The final teams were announced and the starting lineup will once again be impressive. As rumored early on, 18 teams will take the start line — that's two more than last year. Three first-time European teams have been added to this year's list: Liquigas Pro Cycling Team, Quick Step-Innergetic and Rabobank Cycling Team replacing Saunier Duval and the now disbanded Phonak Hearing Systems. Quick Step's Paulo Bettini, the current World and Olympic Champion, previously announced he will be participating. Domestic teams BMC Racing, Priority Health Cycling Team pb/ Bissell and The USA Cycling Development Team have been added for a total of six new teams. Two teams, Predictor-Lotto and Team Slipstream are returning under new names. "With the tremendous success of last year's race and the very positive 'word of mouth' among the professional cycling community, we were extremely fortunate that not only did all of the top teams from 2006 ask to return but we were also able to add some of the new favorites entering the upcoming racing season," said Shawn Hunter, president of AEG Sports. The departure of Kodak Gallery/Sierra Nevada riders, Ben Jacques-Maynes and Jackson Stewart, to Priority Health and BMC Racing now looks pivotal in the selection process as their new teams are in and their old team is out. Saunier Duval is also bitterly dissapointed. Was Gilberto Simoni's complaint about last year's fast pace before unexpectedly missing the Stage 6 start in Santa Barbara the reason for Saunier Duval not getting invited back? Look for teams to announce their rosters starting in early Feburary. Dec 6th update: The organizers of the Tour of California released specific route details of the prologue and each of the seven stages today. I've posted the stage descriptions and profiles from the press release and links to the stage maps on the official site. The great prologue route remains the same. No mountaintop finishes again, but popular KOMs Sierra Grade Road (San Jose) and Balcom Canyon (Santa Barbara) are back and the race will feature several new short steep KOM climbs: Coleman Valley Road as part of stage 1, Trinity Road on the way to Sacramento (stage 2) and Patterson Pass (see photo) before the stage 3 finish in San Jose. As learned from last year's race, a stage race without a mountaintop finish requires a shorter time trial (14.6 miles next year) and it has been moved from stage 3 to stage 5 to further prevent an anti-climatic Golden Jersey outcome. But, the race will be longer overall and likely more difficult. Seeing as Mike Sayers was the only pro at the press conference, I have assumed BMC Racing is one of the teams to be officially announced. LOS ANGELES (July 20, 2006) – California's record-setting Amgen Tour of California cycling road race will once again be staged across more than 650 miles of scenic state highways, roadways and coastline drives February 18-25, 2007, announced race presenter AEG through a series of press conferences in the 12 "host" cities selected for the 2007 event. Beginning with the "traditional" prologue through the streets of downtown San Francisco and traveling over the next week on a newly created course, more than 150 of the world's best professional cyclists will race through "host cities" Sausalito, Santa Rosa, Sacramento (new in 2007), Stockton (new in 2007), San Jose, Seaside (new in 2007), San Luis Obispo, Solvang (new in 2007), Santa Barbara and Santa Clarita (new in 2007), concluding for the first time in Long Beach. The 2007 Amgen Tour of California will be the most significant and important cycling road race held in the United States. "From the world-class riders and competition to the overwhelming support from over one million fans who attended the inaugural Amgen Tour of California and the critical acclaim from the international cycling community, the bar has been set extremely high for the 2007 Amgen Tour of California," said Shawn Hunter, president, AEG Sports, producers of the event. "While the Amgen Tour of California is already being acknowledged as America's most important cycling event, we remain committed to upgrading and enhancing every element of the race experience for the cyclists, spectators, viewers and sponsors. Along with our presenting partners at Amgen, we are proud to produce this great event which not only showcases the exciting sport of cycling and our beautiful state, but brings tremendous economic impact to California as well." The Amgen Tour of California became an unqualified success in its inaugural year, both in attendance – 1.3 million spectators setting records for a single sporting event in the State of California as well as any cycling event ever held on U.S. soil – in addition to generating $100 million in economic growth for the state throughout the eight days of the race. Returning this year as the title sponsor of the 2007 Amgen Tour of California, Amgen, the world's leading biotechnology company, will continue to leverage the race to raise awareness and support for people affected by cancer through the Breakaway from CancerTM education and fundraising initiative. Based in Thousand Oaks, Calif., Amgen's invaluable support of the inaugural Amgen Tour of California has helped to ensure its success and impact beyond the sporting arena. Versus, formerly called OLN, announced that it will add the 2007 Amgen Tour of California to its line-up of televised major races next year, featuring 12 hours of race coverage, including one hour recaps each weekday evening and Saturday and two hours of live coverage on both Sundays. The 2006 Amgen Tour of California attracted some of the world's most renowned and respected riders, creating an action-packed competition for riders and spectators alike. As the winner of the 2006 Amgen Tour of California, California resident Floyd Landis (USA) of Phonak Hearing Systems has already gone on this year to win such races as the Tour of Georgia and the Paris-Nice stage race, and is currently a top competitor in this year's Tour de France. Sanctioned by the UCI (Union Cycliste International) and USA Cycling, the Amgen Tour of California has drawn the attention of everyone from cycling enthusiasts to first-time spectators, making it one of the most anticipated events on the international cycling calendar. "We are again proud to welcome the Amgen Tour of California back to the USA Cycling National Racing Calendar," said Steve Johnson, CEO, USA Cycling. "The inaugural edition was a phenomenal event that was integral in putting big-time bicycle racing back on the map in the United States. With a solid foundation on which to build, the Amgen Tour of California is on pace to become one of the top international cycling events in the world, which is paramount in growing the sport in the United States." Between the opening Prologue in San Francisco and the finale in Long Beach, the 2007 race will visit 12 host cities for official stage starts and finishes, while the many communities along the route will have the opportunity to witness the excitement of elite bicycle racing. Host cities for the eight daily stages include: San Francisco, Sausalito, Santa Rosa, Sacramento, Stockton, San Jose, Seaside, San Luis Obispo, Solvang, Santa Barbara, Santa Clarita and Long Beach. At 1 p.m., riders will kick off the 2007 Amgen Tour of California with a short, but intense Prologue, sponsored by Union Bank of California, through the streets of San Francisco. Starting by the Ferry Building at Pier 1, the cyclists will ride 1.9-mile individual time trials along the Embarcardero, making the sharp left onto Bay Street and then up the tight, steep climb through Telegraph Hill to the finish at Coit Tower. Starting on the northern side of the San Francisco Bay, Stage 1 will cover almost 100 miles from Sausalito to Santa Rosa. The stage, sponsored by Herbalife, begins with a climb from Mill Valley up to Mt. Tamalpais State Park before turning toward Muir Beach. 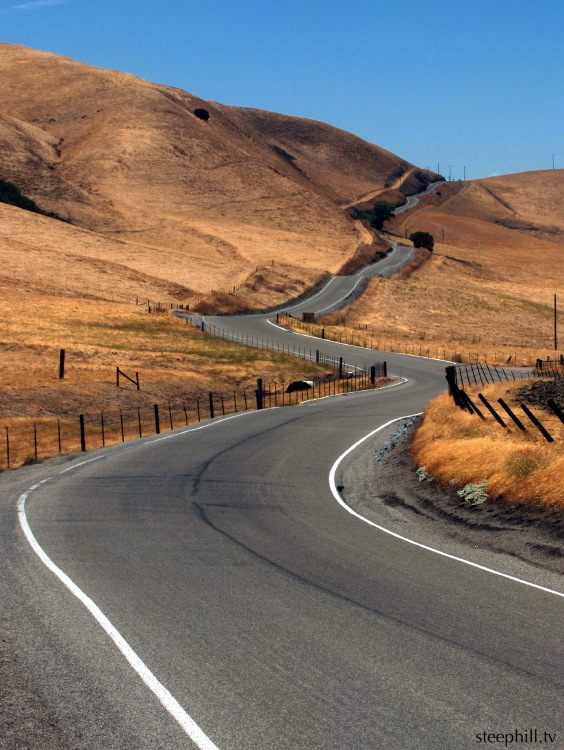 The route mirrors that of 2006 all the way to Valley Ford, but where the riders headed east to Santa Rosa, the 2007 route will continue north to Bodega Bay and turn onto Coleman Valley Road, a landmark climb in Northern California. Then, spectators can watch the stage win unfold as the field heads downhill from Occidental for three finishing circuit laps in downtown Santa Rosa. In 2006, Santa Rosa set the mark for one of the most enthusiastic and largest crowds of the entire Amgen Tour of California. A scenic start through several Sonoma County wineries will quickly turn into one of the most significant climbs of the race as the peloton heads east en route to Sacramento. Twelve miles from the start, Trinity Road's vertical climbs and treacherous decent into the wineries of Napa Valley will make it one of the most difficult climbs of the entire race. Continuing east past Lake Berryessa, the peloton will head through Davis, recently named the best cycling town in the U.S. by Bicycle Magazine. With a quick turn to the north, the route will follow the Sacramento River to the well-known Tower Bridge and on to the Capitol Mall. The stage concludes with three circuits through downtown, finishing on the front step of California's Capitol Building, a perfect viewing location. After a neutral start with parade laps through Stockton's revitalized downtown area, the peloton will head west through California's farm lands. After passing through Tracy, the riders will encounter a climb new to this year's race, Patterson Pass. After passing through the city of Livermore, The route then connects to the familiar roads of the 2006 Stage 2 route on Calaveras Road. This long, constant grade leads to the most difficult climb of the race, the Category One (highest ranked in order of difficulty) Sierra Road climb in San Jose. After completing this KOM (King of the Mountain) competition, the peloton will finish the 94.6-mile course in front of San Jose City Hall. The remarkable views of stage four will make it a favorite for riders and spectators alike. Beginning in Seaside with a short neutral lap and traveling along a similar route to last year's Stage 4, the peloton will head south on scenic Highway 1 where the mountains and redwood forests flank the Pacific Ocean. At more than 130 miles and with three KOMs, this is the longest stage of the race and will test the riders on consistently hilly and technical terrain. The six-hour day will take the riders through Big Sur and by Hearst Castle before shifting inland toward the finish at the intersection of Osos and Monterey in San Luis Obispo. The quaint Danish village of Solvang hosts some of the ProTour teams for training camps as well as some of the largest cycling events in the U.S. At only 14.5-miles, and with the start and finish located only two blocks apart, Stage 5 is an ideal location for spectators to view the race. The route will highlight some of the most beautiful areas and towns of Central California, winding through quaint towns, vineyards, farms, and one short but steep climb. This year's shorter, flatter and faster time trial will create a challenging test for the riders. 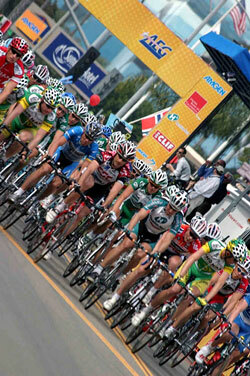 This could be the pivotal stage for the 2007 Amgen Tour of California. This is one of the longest stages at 105 miles, and it is heavy on climbs with four KOMs, two Sprints and a demanding finishing circuit in Santa Clarita. With the individual time trial late in the tour, there could be several riders separated by just a few seconds. After a start in view of the Santa Barbara shoreline, this stage, sponsored by Health Net, will be the last chance for a solid favorite to emerge before the circuit race finale in Long Beach. Once the peloton hits Highway 150, the racers will face two KOMs before passing Lake Casitas and riding into the scenic town of Ojai for the first Sprint of the day. The third KOM will be just a few miles outside Ojai, and then the course will head downhill into Santa Paula for the second Sprint of the day among fragrant citrus groves. The ominous Balcom Canyon will be the final climb of the day, where in 2006, nearly 10,000 fans formed a narrow corridor for the riders. The cyclists will end the day with three circuits in Santa Clarita that finish at McBean Parkway at the Valencia Town Center. Stage 7 is flat, fast, and will be a favorite with spectators, featuring a lot of sprint action as the cyclists race in 10 laps around a circuit course in downtown Long Beach. Sponsored by Amgen, the stage includes part of the famous Long Beach Grand Prix course used for CART race cars, meaning a legacy of roads that are wide and fast. Views of San Pedro Bay and the Pacific Ocean will be visible for the entire course, with a backdrop of the famed Queen Mary in the bay. Organizers expect a hard sprint to the finish; as with all the Grand Tours of Europe, winning the final stage of the 2007 Amgen Tour of California is a prize coveted by the riders. LOS ANGELES, Calif., March 8, 2006 - The recently concluded Amgen Tour of California, an eight-day professional cycling road race, drew more than 1.3 million spectators from February 19-26, 2006, setting records in attendance for any single sporting event in California, as well as for any cycling event in the U.S. The inaugural event, which covered 600 miles of California roadway from San Francisco to Redondo Beach, received praise from its host cities, teams and sponsors, as well as from the Union Cycliste International (UCI), the international governing body of cycling. In addition to the thousands of fans lining every stage of the race, the official Web site had 367,000 visitors who registered more than fifteen million "page views" over the eight days of racing, with the vast majority enjoying live race coverage provided by Adobe and enhanced by Google technology. A breakthrough in Internet race coverage, www.amgentourofcalifornia.com provided fans with live text updates, four channels of live streaming video and continuously updated still photos from the road. The site continues to be one of the sport's most viewed with fans logging on for race recaps, statistics and commemorative memorabilia. California resident Floyd Landis (USA) of Phonak Hearing Systems walked away as the overall champion of the Amgen Tour of California with El Segundo-based CSC taking the overall team top prize. With preliminary details of the 2007 route expected in the next 30 to 60 days, race presenter AEG has reiterated its commitment to building the race into one of the premier sporting events in the world. "We set out to create an event that will one day rival the Tour de France," said Timothy J. Leiweke, President and CEO of AEG. "We will not rest until we allow the American riders to have the best event in all of cycling in their home country. This year was a giant leap toward achieving that goal." The 10 host cities for the inaugural race included San Francisco, Sausalito, Santa Rosa, Martinez, San Jose, Monterey, San Luis Obispo, Santa Barbara, Thousand Oaks and Redondo Beach. Cities throughout California are eager to host the second annual race. "We're coming back in 2007 and already are thinking about ways to make this event even better," said Shawn Hunter, president of AEG Sports, presenters of the Amgen Tour of California. "We are extremely satisfied with this first year, and the best is yet to come." "We built this race on three objectives: to create a great experience for riders, the communities and the corporate sponsors," said Bob Colarossi, managing director of the Amgen Tour of California. "The cities that we visited this year are very pleased with the positive effect that the race had on their communities. Not only have our 2006 host cities asked us back, but new cities have also inundated us with requests to come to their areas next year." The world's best riders echoed the sentiment, expressing an overwhelmingly positive experience in California. "From the moment I heard about the Amgen Tour of California, I knew it would be of the highest quality," said Santa Rosa resident and California Travel and Tourism King of the Mountain competition winner Levi Leipheimer (USA) of Team Gerolsteiner. "I can say now that it was even better than expected," continued Leipheimer who won the race's Prologue held in San Francisco. "It's very high up on the list. I think it was a great event," added overall fourth place finisher and winner of two stages George Hincapie (USA) of the Discovery Channel Professional Cycling Team and spokesperson for the Amgen Breakaway from CancerTM initiative. "It's a good indication that all of the foreign riders were happy with the event. It couldn't have gone any better." When asked to compare the California race to those about to take place in Europe, overall second place finisher David Zabriskie (USA) of Team CSC said, "We're going to take a lot of warm clothes [to Europe] and wish this race was still happening." The highest ranking officials from UCI and USA Cycling - the international and national governing bodies of the sport - were on hand in California to witness the race. Both Pat McQuaid, president of the UCI, and Gerard Bisceglia, president of USA Cycling, gave high praise to the inaugural event. "It looks to be a good race. Not just good teams here, but the teams have brought good riders as well, and they're all motivated to do very well. From the UCI's point of view, it's good to see this in its first year," said McQuaid. "I have no doubt that the potential is here to grow and develop this race into a big, big spectacle in both the state of California and the United States." Speaking about the importance of establishing races like the Amgen Tour of California for the overall development of American professional cycling, Bisceglia said, "The hardest thing for USA Cycling is having your children leave home. To let our riders grow up, we have to let them leave home and go to Europe. But if we can bring this kind of cycling to the U.S., we can keep our children at home." To help ensure the success of the Amgen Tour of California, race presenter AEG partnered with like-minded companies who have an interest in growing the sport of cycling while communicating the importance of health and wellness to California communities. 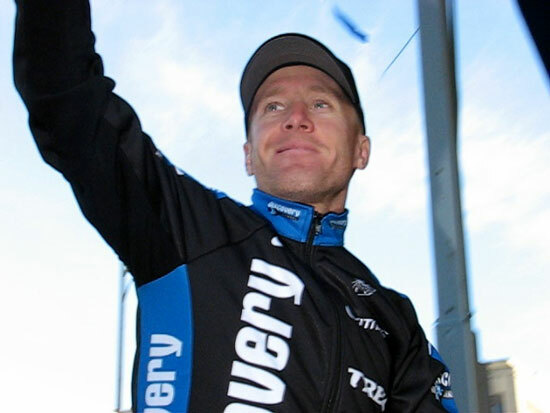 In December 2005, the race's title sponsor Amgen launched the Breakaway from Cancer initiative. A partnership between Amgen, The Wellness Community and George Hincapie, Breakaway from Cancer is a complementary component of the race that includes a series of free workshops designed to help people who are affected by cancer learn about new treatments, side effects, support networks and educational resources. "We are delighted with the inaugural Amgen Tour of California," said Kevin Sharer, Amgen's chairman and chief executive officer. "We are also pleased with the success of our Breakaway from Cancer initiative, which resulted in a donation of $1.1 million to The Wellness Community to support cancer patients. Amgen looks forward to our continuing sponsorship of this world class cycling event." In addition to Amgen's partnership with AEG, eight companies joined as founding partners for the inaugural year: Adobe, ADT Security Services, California Travel and Tourism, Clif Bar, Health Net, Herbalife, KB Home and Union Bank of California. Coca-Cola Zero, Google, Kendall-Jackson, Prodir and Voler also supported the race as official partners. "Our partners are as vital to the success of this event as the athletes and host cities," said Hunter. "Their belief in this race, support of our vision and commitment to ensuring that this event was a great experience for everyone involved made this one of the greatest first-year events that I have ever been a part of."